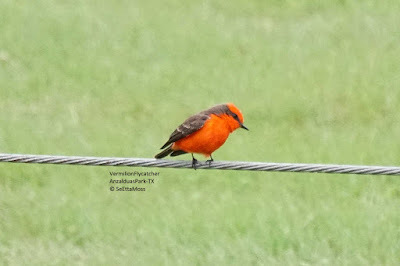 It was crummy weather, mid 30's and drizzling when I spotted this Vermilion Flycatcher at Anzalduas Park. 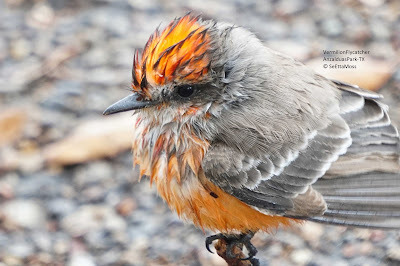 The bird's feathers were pretty wet which caused them to stick together in some areas. Instead of sallying out to catch insects in flight it was foraging on the pavement. So I drove slowly near it and parked about 40 feet away. And I stayed in my car to photograph it using my car as a blind, a technique I use a lot as it reduces disturbance to the birds. After watching the bird several minutes it flew near by car and proceeded to forage on the pavement within 10-15 feet from me. 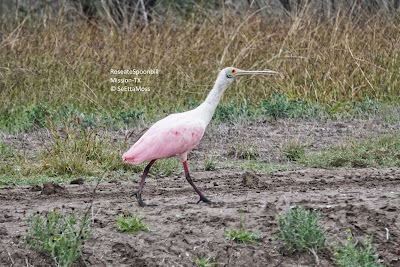 I used the silent setting on my camera (while I don't hear any noise I have seen some birds reacting so there is apparently some sound that is audible to them, but this bird did not show any reaction to my shots).